iCaughtSanta.com is looking for bloggers to do a review and giveaway! Bloggers can apply until 12/15 and the final selection takes place on 12/15. In three simple steps anyone can upload a holiday photo, add Santa Claus and print it as proof… or share it via email, Facebook and Twitter. 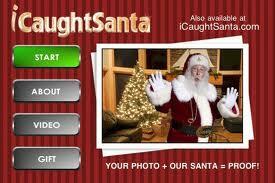 Last-minute shoppers can purchase Gift Cards and eGift Certificates for loved ones with children, making iCaughtSanta.com a great gift idea even if you don’t have kids yourself. Bonus #1: 25% off with this code: SAVE25 Feel free to share as you wish. Bonus #2: They will send you 5 additional codes to giveaway if you have more that 30 unique entrants to your giveaway. Contact the sponsor with your verification link and they will send the bonus codes. Thank you for posting the details and sign up information for our review/giveaway. I have some great news! We have extended sign ups through the 20th. Please let everyone know that their timing is perfect!